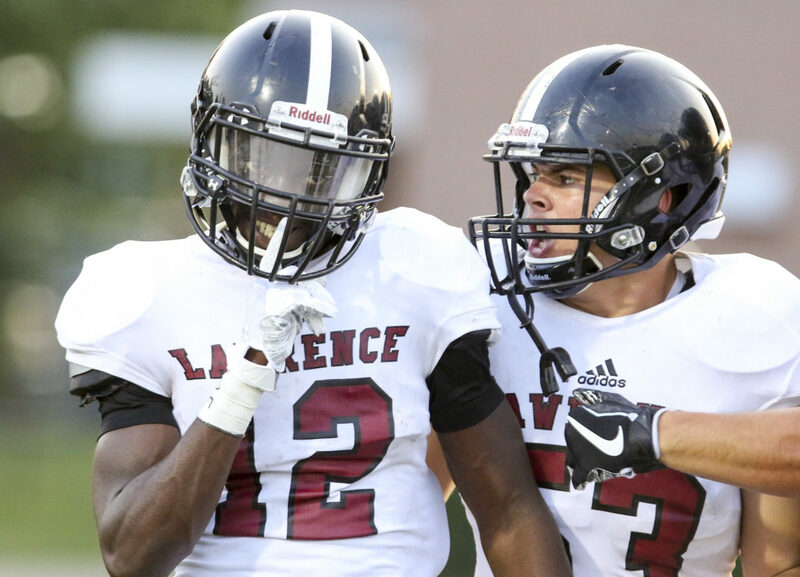 Lawrence High receiver Ekow Boye-Doe silences the Shawnee Mission Northwest crowd after a touchdown as he celebrates with teammate Jacob Mills during the first quarter on Thursday, Aug. 31, 2017 at Shawnee Mission North District Stadium. 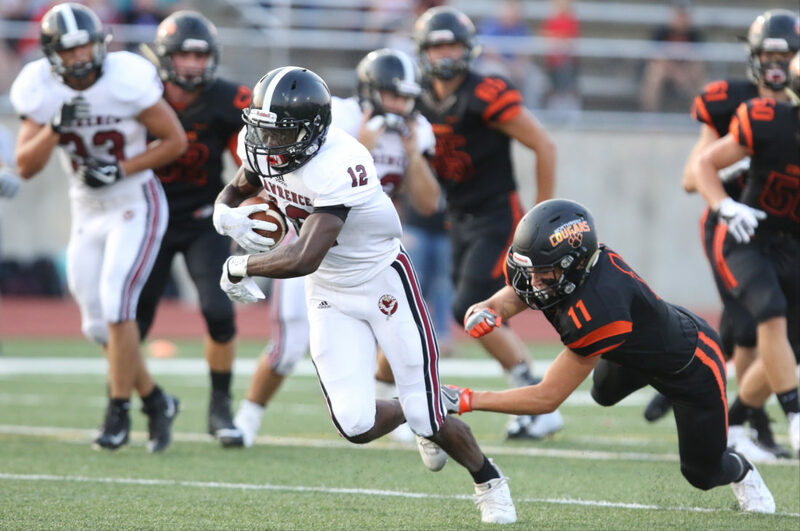 Lawrence High receiver Ekow Boye-Doe escapes Shawnee Mission Northwest defensive back Mark Addington as he runs for a touchdown during the first quarter on Thursday, Aug. 31, 2017 at Shawnee Mission North District Stadium. 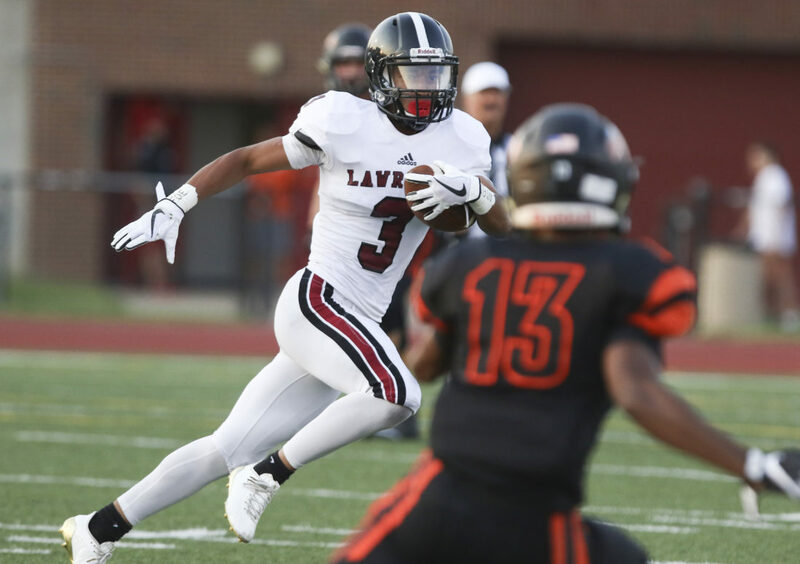 Lawrence High receiver Jalen Dudley looks for a hole against Shawnee Mission Northwest during the first quarter on Thursday, Aug. 31, 2017 at Shawnee Mission North District Stadium. 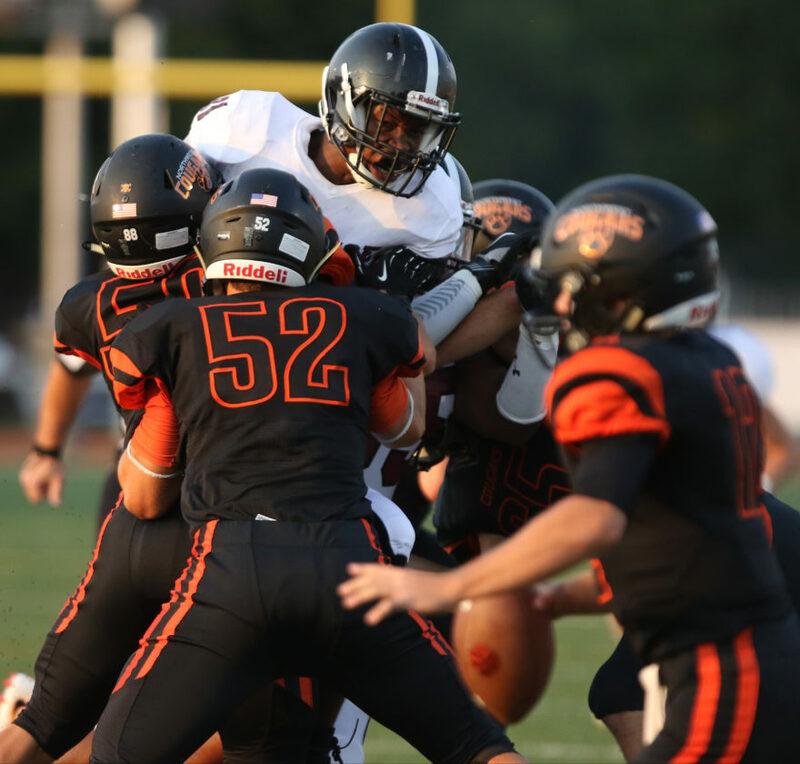 Lawrence High defensive lineman Eric Galbreath is held up by several Shawnee Mission Northwest during the first quarter on Thursday, Aug. 31, 2017 at Shawnee Mission North District Stadium. 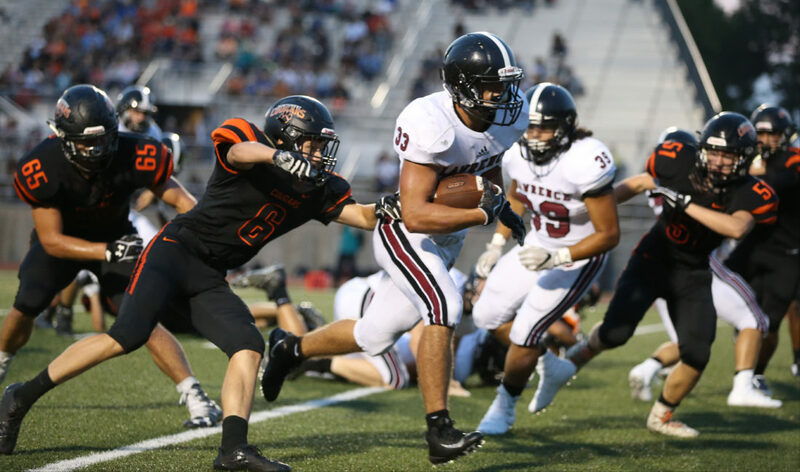 Lawrence High punt returner Jakoby Masters tries to regain his footing as he takes off past Shawnee Mission Northwest special teams player Mark Addington during the first quarter on Thursday, Aug. 31, 2017 at Shawnee Mission North District Stadium. 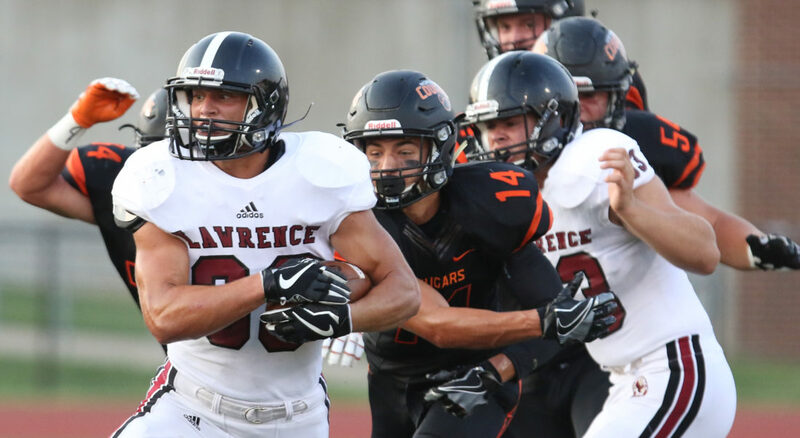 Lawrence High running back Hunter Krom gets past Shawnee Mission Northwest defensive back B.J. Harvey during the first quarter on Thursday, Aug. 31, 2017 at Shawnee Mission North District Stadium. 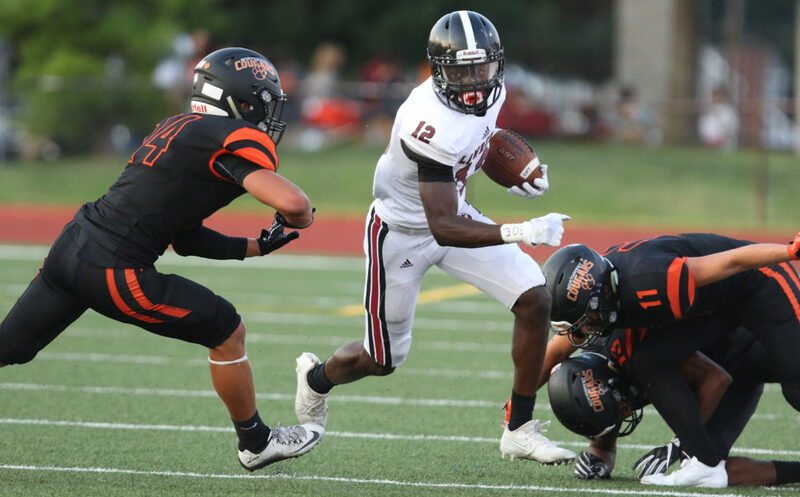 Lawrence High receiver Ekow Boye-Doe looks to make a move against Shawnee Mission Northwest defensive back BJ Harvey during the first quarter on Thursday, Aug. 31, 2017 at Shawnee Mission North District Stadium. 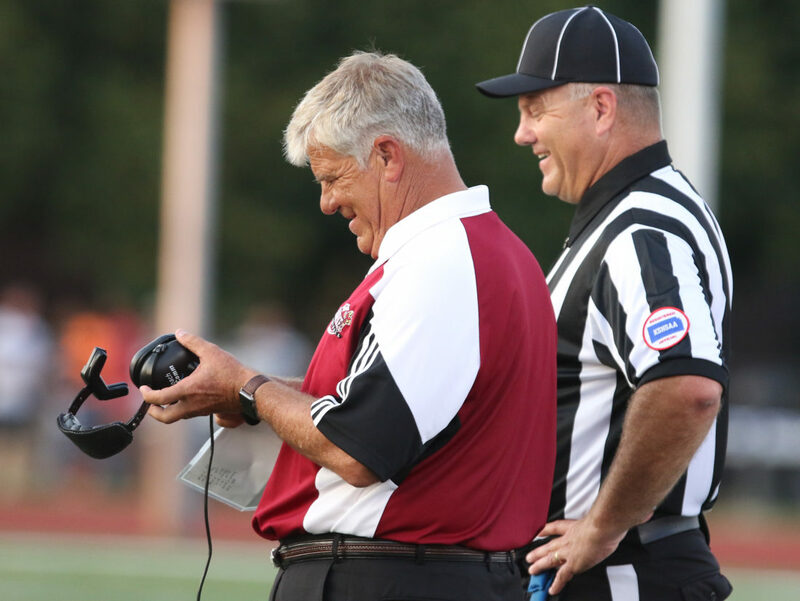 Lawrence High head coach Dirk Wedd laughs with a game official during the first quarter on Thursday, Aug. 31, 2017 at Shawnee Mission North District Stadium. 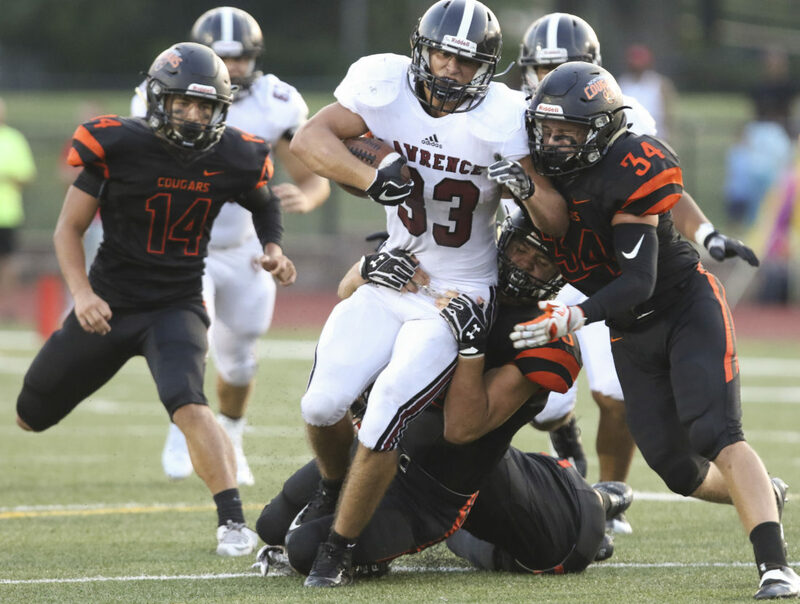 Lawrence High defenders Caleb Mondi (11) and Isaac Flint, right, bring down Shawnee Mission Northwest running back Jamie Alexander during the first quarter on Thursday, Aug. 31, 2017 at Shawnee Mission North District Stadium. 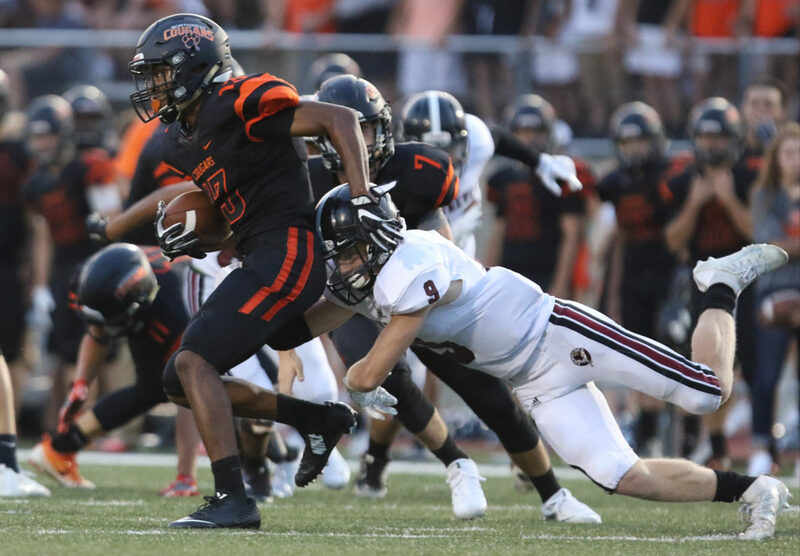 Lawrence High defensive back Jakoby Masters brings down Shawnee Mission Northwest running back Jamie Alexander short of the first down during the first quarter on Thursday, Aug. 31, 2017 at Shawnee Mission North District Stadium. 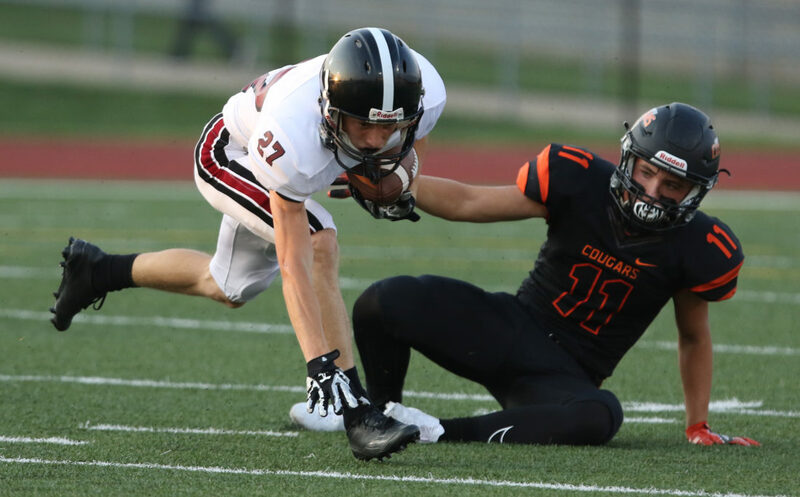 Lawrence High running back Hunter Krom gets in for a touchdown past Shawnee Mission Northwest defensive back Tristan Aycock during the second quarter on Thursday, Aug. 31, 2017 at Shawnee Mission North District Stadium. 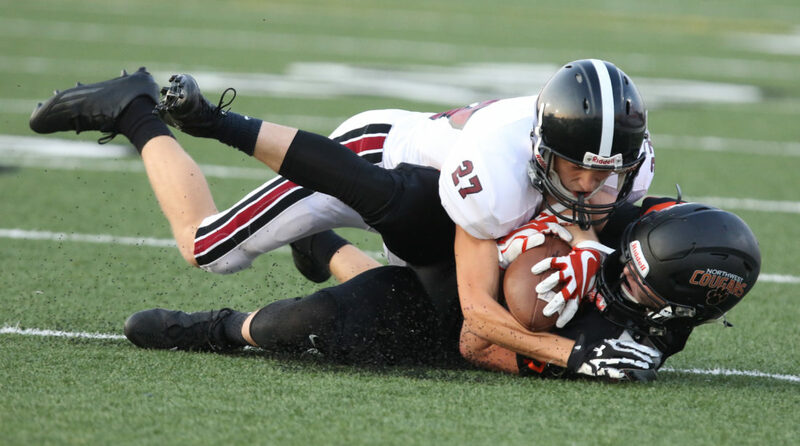 Lawrence High defensive back Harry King wraps up Shawnee Mission Northwest receiver Floyd Martin during the second quarter on Thursday, Aug. 31, 2017 at Shawnee Mission North District Stadium. 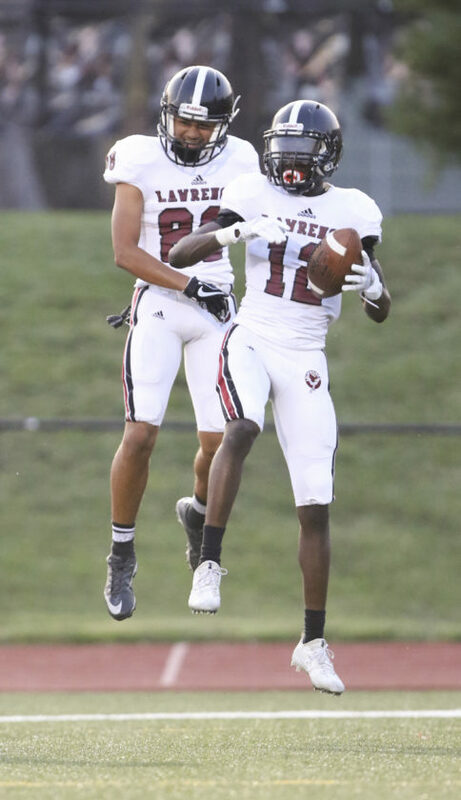 Lawrence High receiver Ekow Boye-Doe (12) celebrates with teammate Chris McGee after Boye-Doe's second touchdown against Shawnee Mission Northwest during the second quarter on Thursday, Aug. 31, 2017 at Shawnee Mission North District Stadium. 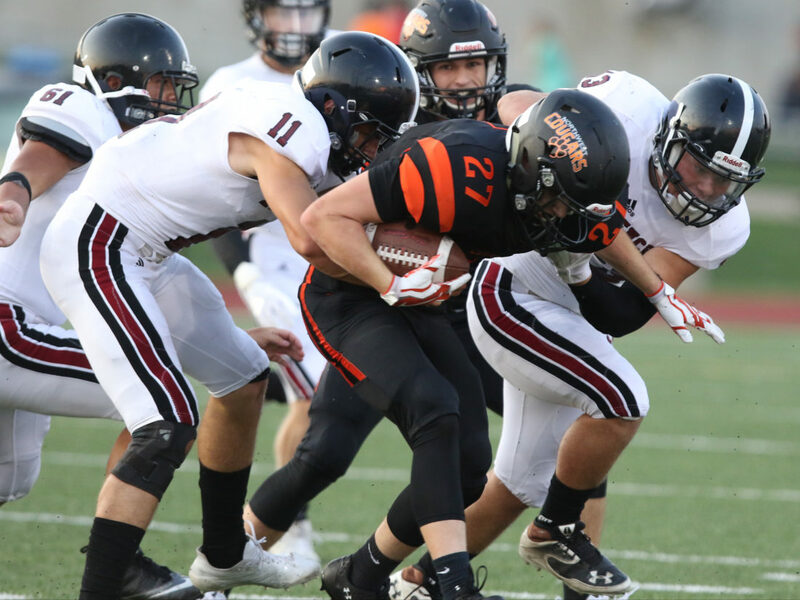 Lawrence High running back Hunter Krom trudges ahead while several Shawnee Mission Northwest defenders hang on during the second quarter on Thursday, Aug. 31, 2017 at Shawnee Mission North District Stadium. 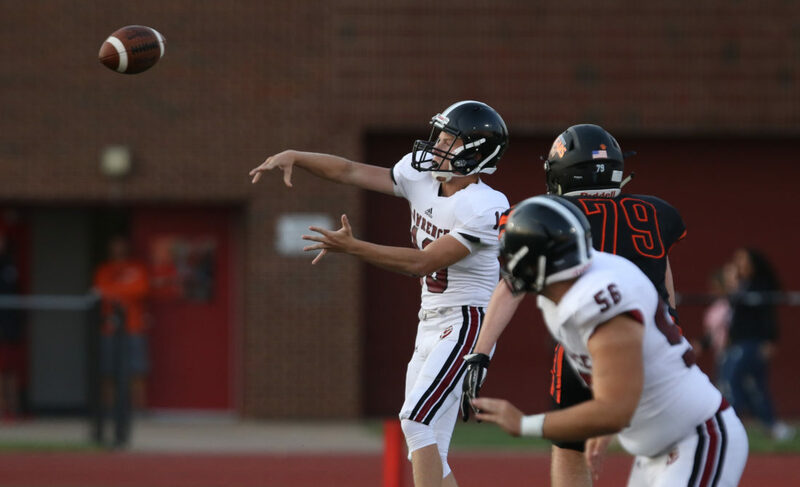 Lawrence High quarterback Garrett Romero throws against Shawnee Mission Northwest during the first quarter on Thursday, Aug. 31, 2017 at Shawnee Mission North District Stadium.